I have a thing about Japanese bento, it’s an art that I simply don’t have the skills, techniques, or patience to attempt. There has been a surge in interest in bento boxes, especially kids-friendly bento boxes that they can take to school or nursery. 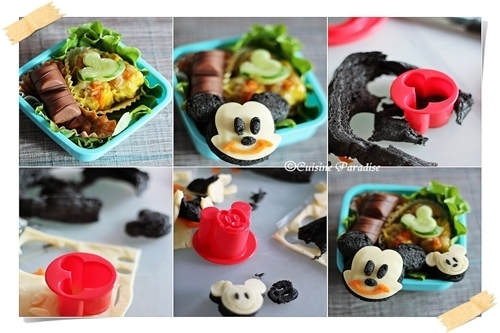 That’s why I invited Ellena Guan or Cuisine Paradise to share a bento box recipe, and she created this most adorable and cutest looking Mickey Bento for us! Cuisine Paradise is an awesome food blog (finalist of Singapore’s best food blogs)—it’s full of many delicious homemade dishes, bento collections, and baking recipes. Go check out Cuisine Paradise now! A few weeks back I received an email from Bee together with invitation to do a Bento related guest post at Rasa Malaysia. I was so surprise after reading her email because for so many years I have being one of her silent readers whom always drool over her mouthwatering photos and recipes which our family enjoys. And today I am so honored to be one of the invited guests to share my bento post with all her readers. I have started making bento way back in 2008 when my boy was about 4 years old as I used to pack quick and easy snacks for him to bring to his Nursery Class. But then I stopped after sometime due to my busy working schedule which holds me back to make bento only during certain weekends or special occasions. And it’s only recently that I am back in making bento again due to my boy’s request because he wanted his favourite iPhone game “Angry Birds” to appear as in a bento set. 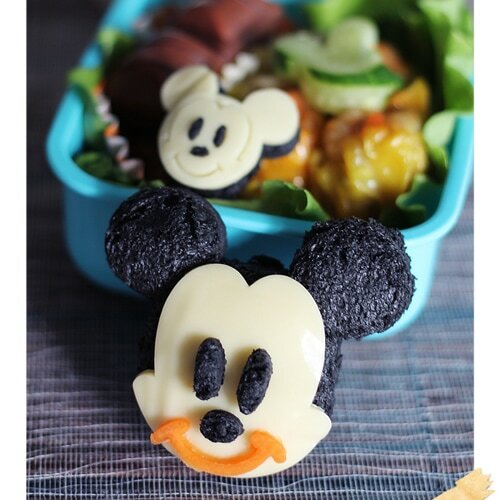 For this post, instead of Angry Birds I will be sharing two Mickey Bento which I have discussed with Bee. First bento set can be used for either Lunch/Dinner as it comes with soup, rice, veggie, prawn and fresh fruit. While the second set will be more suitable for tea-snack or field trip outing. Usually before I start packing the bento meal, I would have a rough ideas on what to incorporate into the box, for example like most Japanese mummy they would go for the 3:1:2 rules where they include 3 parts grains, 1 part protein and 2 parts vegetables/fruits. But after all it is still up to individual preference when coming to bento packing. Lastly there are some points which you might want to take note in order to keep the packed food safe for kids consume. 3. Keep hot foods hot using thermal containers while cold foods cold using cold packs. Thanks. Hope you would like these two sets of Mickey Bento. Blanched spare ribs in boiling water for 1 minute remove rinse and set aside. Bring 1.2 litres of water to boil, add in all ingredients except the reserved “Mickey” shaped cutouts. Lower the heat and simmer for about 20 minutes, next place the mickey cutouts on a metal soup ladler lower into the simmering soup and cook for 15 seconds. Remove and set aside in serving bowl. Ladle warm soup into the bowl before serving. Place a sheet of cling wrap on one hand and scoop about 2 tablespoons of cooked rice on it. Shape the rice into a ball. Remove the cling wrap and place it on a paper cup liner while working on the two ears on the side. Using the same cling wrap scoop 1 teaspoon of cooked rice on it and shaped into semi-circle. Open the cling wrap and cover the rice ball with a 4cm diameter round nori sheet to form the ear. Repeat step 3 again. Next place the 1st round rice ball onto a cling wrap, using 2cm long thin spaghetti to attach the ears on the side of rice ball. Shaped these three parts of the mickey features tightly using the cling wrap and your hands. When done remove the wrapper and place it on the paper cup liner into the assigned box and start adding the facial expression using mickey shape cutter, cheese and carrot shown above. To make the eye balls and nose, use a craft puncher on a nori sheet to get small oval shapes and paste it on the cutout cheese. For the vegetables; preheat a small saucepan with 1 teaspoon of cooking oil sauté the garlic till fragrant before adding vegetable. Give a quick stir and cook for 30 second, toss in wolfberries and cook for another 5 seconds. Remove and arrange in another paper cup liner at the side of the Mickey onigiri. Next preheat saucepan with drizzle of oil, sauté garlic till fragrant add in assorted capsicum and onion cook for 30 seconds before adding in the shrimp. 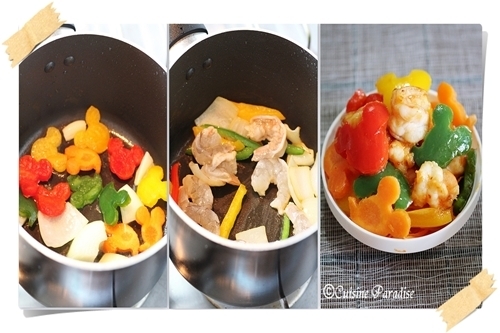 Give the mixture a quick stir, add in ketchup mix well cook until shrimp changes colour. Turn off the heat, dish up and assemble it on bento container. Arrange the serving bento with mickey head dragon fruits and some seedless fresh lychee of any fruits of your choice. Get ready a small square bento box, line it with some lettuce and place the cooked siew mai into paper cup liner and position it at a corner of the bento box. 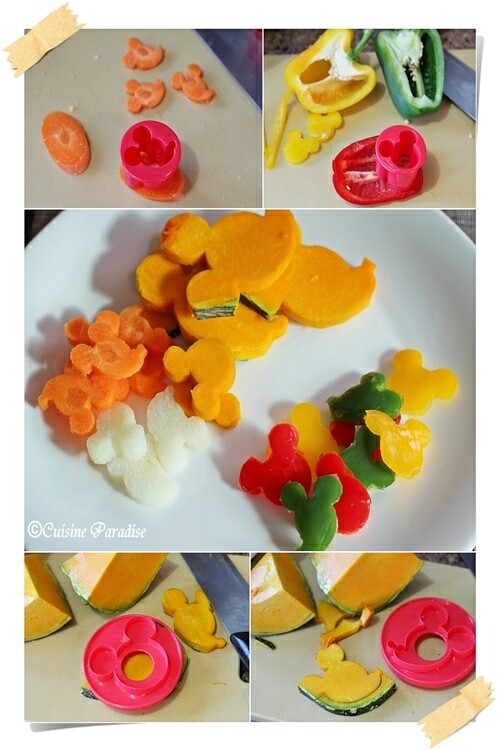 Use a small mickey cutter, cut out mickey face shaped from the cucumber and places it on top of the siew mai. Place chocolate/fruit bar at another corner of the bento leaving the front part clear for the bread. Next with a Mickey design multi-cutter cutout mickey face shaped from the bread and decorate the feature expression with the cutter using cheese for the face, bread for eyes and nose, carrot for the mouth. (refer to the step-by-step photo illustrations above. 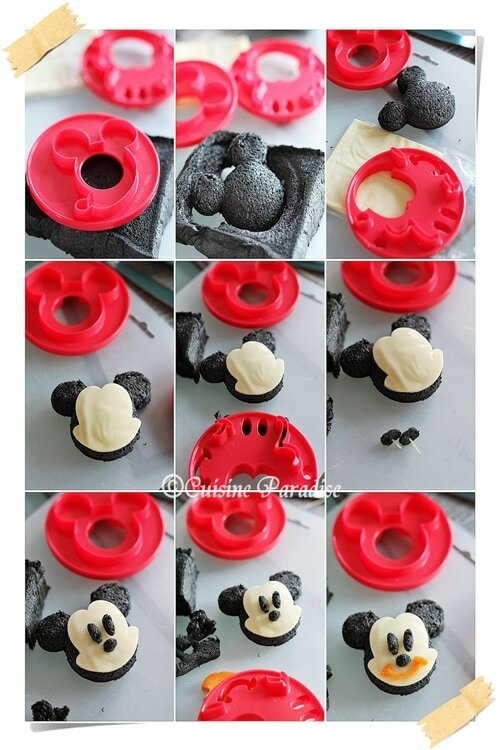 Lastly using a small mickey head cutter repeat the same step to make a mini Mickey using bread and cheese. When done, arrangement everything into the box and serve with fresh milk or juice. You do not need to cook separate meals. You can still prepare cute bento for your kid(s) during your usual daily cooking by reserving small kid’s serving portion and incorporate it with “cute/special” shaped cutouts into their portion. Bento is one of the long outstanding things in my to-try list. Ellena’s bento boxes are always full of creative ideas. No exception for her Mickey Bento featured there. Love it! What a great guest post Ellena! You have been making such a cute bento lately and I absolutely love it! Bee, I hope you invite her more often so we can see her bento creations. :-) Hope you two ladies have a nice week! 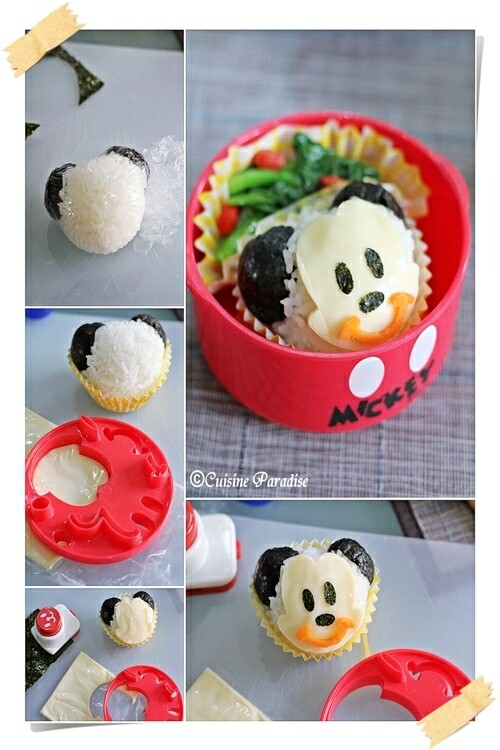 oh my gawk, the mickey bento is so cute…how long does it take to put together a bento like this? My little boy is learning how to speak, when he saw the picture, he said “Mickey.” I’m sure he’d love to eat Mickey. Those Mickey food cutters are so cute. I wonder where you would find such a thing? That is a very cute bento!! Hi Ellena, where can I get the Mickey Mouse cutters in Singapore? Thank you. Hi Cher, You can get these mickey mouse cutters at a shop call KAIKAI Gift at lvl 2 of Chinatown Pt shopping center. OMG!! These are so cute! I feel like such a bad mother, I have brought five children up on boring packed lunches. Can you tell me where I can get these style of cutters? How does someone find the time to do this? love the recipe and website, i will come back here more often! !